1. In a medium bowl, combine cream cheese, sour cream, brown sugar, and coffee liquor. Blend until smooth. 2. Fold in whipped topping until just mixed. 3. Chill in refrigerator for at least one hour. 4. 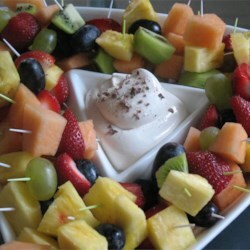 Serve with your favorite fruit! 1. Combine all ingredients in a small pot. 2. Stir well and bring to a simmer over medium-high heat. 3. Lower heat and allow to simmer for 20 minutes. 4. Remove from heat and let mixture cool. The puree in a blender. 5. Use on your favorite meat!